Good sleep and mood are important for health and keeping active. Keeping active is important for sleep, mood, and health. Good health is important for sleep, mood, and physical activity. The only gut products I’ve ever really recommended are Bifido (eg, something like this or this) and GOS… and start with a very low dose. The authors of this recent review have suggested 3 main pathways in which this might occur. immunoregulatory pathway: mediated by cytokines, PGE2, etc. neuroendocrine pathway: enteroendocrine cells which secrete hormones that directly influence the HPA axis and the CNS. 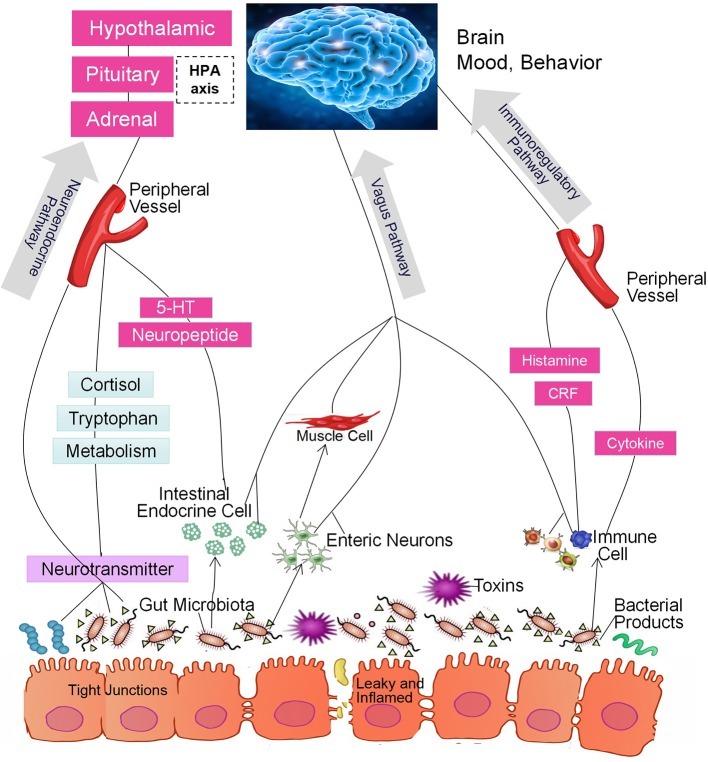 Importantly, the CNS can also regulate the ‘biome via these pathways. Everything is connected! If something isn’t right with your health, these are probably the places to look. The main 2 ‘biome inhabitants are Bacteroidetes and Firmicutes. Firmicutes (like Acidophilus) have been associated with obesity. Sometimes. Bifido is neither, it’s an Actinobacteria. Circadian misalignment and sleep deprivation have been shown to influence the relative abundances and ‘biome metabolites (eg, Davies et al., 2014). Jet lag increases Firmicutes which is reversed upon recovery. Whoa. Bifido supps have been shown to improve emotional and cognitive indicators, the stress response, and anxiety in people with IBS (Plaza-Diaz et al., 2017)… and bifido is reduced in people with chronic fatigue syndrome. Stress increases gut permeability, bacterial translocation, and bloating which is associated with sleep disorders because of course it is. Not too surprising as 90% of your serotonin comes from chromaffin cells in your gut and bifido actually produces GABA. Bifido are reduced in patients with depression (correlation =/= causation, but this is highly consistent in a variety of contexts). Sleep loss, circadian misalignment, affective disorders, metabolic disease, the ‘biome, and inflammation. They’re all connected! If something isn’t right, these are probably the places to look.